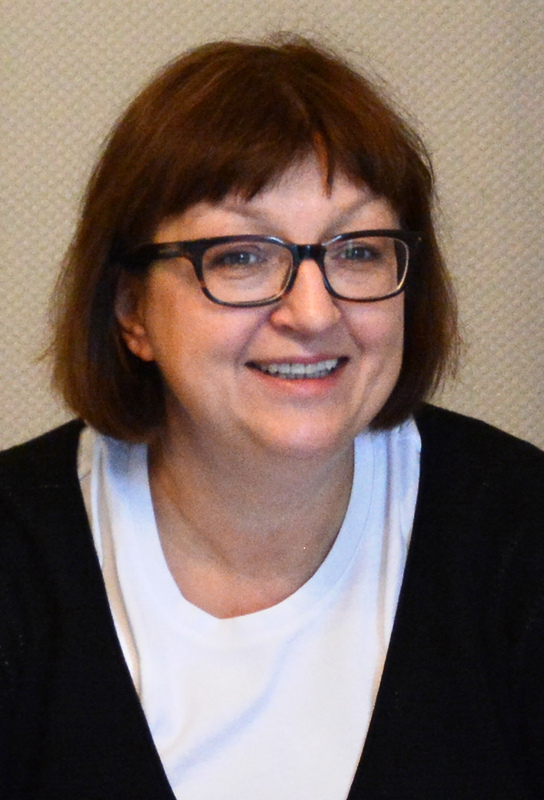 RIGA, Latvia – Inside a sparsely decorated, dimly lit meeting room in her company headquarters, Galina Timchenko takes a deep breath as she remembers the fateful day nearly four years ago when she was fired as the editor in chief of Lenta, one of the most popular and fearless news blogs in Moscow. Lenta, dubbed by one Russian journalist as the “Russian New York Times,” had made its mark by refusing to censor itself and continuing to publish news viewed as antagonistic toward Russian President Vladimir Putin and his allies. “It was a very important existential experience, because you had been working for 15 years, 15 hours a day. You had been building something very special. You were on top. You were the number one Russian internet news outlet. “And it disappeared like this,” she said, widening her eyes and snapping her fingers. On March 12, 2014, Timchenko received a phone call from Lenta’s owner, Alexander Mamut, a Kremlin-connected oligarch who had become the owner of the media outlet just two years earlier. She was out as editor. Timchenko, 55, said she saw this coming. Her relationship with Mamut had declined ever since the crisis in Ukraine in 2014, when Putin annexed Crimea in an act widely viewed as an affront to international law. When, in this contentious political atmosphere, Timchenko published an interview with a far-right Ukrainian nationalist, she was ousted. In the next few days, Timchenko said she went from sobbing privately in a swimming pool in Budapest to returning to Moscow to unite with her coworkers, who had resigned in protest of her firing. What she and her colleagues also did, however, was plan a special project that would change the scope of journalism produced by Russian reporters. They started a new online site, Meduza, which they said would allow them to continue reporting without censorship – because they would be based in Riga, Latvia, within the boundaries of the European Union. Living in and working from Riga, an hour-and-a-half flight from Moscow, Timchenko and her staff began to produce independent news about the Russian Federation via a combination of content aggregation and original reporting. Their site now reaches 9.5 million unique visitors a month. "My only freedom was books"
Timchenko, in a November interview inside the Meduza office, said she preferred not to talk about her past or her personal life, or even give the names of her loved ones. Growing up in the center of Moscow during the height of the Cold War between the United States and Soviet Union, Timchenko lived on Gorky Street (now named Tverskaya Street), close to a Georgian restaurant, Aragvi, and a 17th-century church. Born on May 8, 1962, Timchenko said she was raised mostly by her older sister, who is an accountant, after her parents divorced when she was 5. “She played the role of mother for me because my mom worked very hard,” she said of her sister. Timchenko’s mother was the director of the USSR Science Academy Publishing House, now known as Nauka (Science), which was the main scientific publisher in the Soviet Union. Because of her mother’s work, Timchenko had access to academic journals in the Soviet Union. Those sparked her interest in literature and current events, she said, and she would often read books brought to her by diplomats and family friends who had traveled as scientists to the United States and France. Timchenko said she made the most of the creativity inside the walls of her prestigious Moscow-based high school now known as Kaptsov Gymnasium #1520. One of her classmates was Victor Pelevin, who would become a famous novelist. When she graduated, her mother insisted that she enroll in a medical institute to become a doctor. After five years at the Third Moscow Medical Institute, just one year short of graduating, Timchenko quit. She turned to English and literature, and in the 1990s, she attended every public lecture she could, including some by journalists. At 28, Timchenko was divorced from her husband and living alone with her only child, a daughter who is now in her 30s. That’s when she stumbled upon her first job in the media. She has never looked back. “It was accidental. It was something by chance,” Timchenko said. A friend mentioned that Kommersant, the most prominent business newspaper in Russia at the time, was looking for “well-educated” people for its news service. After two years at the news service, and with the Russian economy in decline, she began searching for a new job. One of her Kommersant colleagues mentioned that there was “some type of internet project” starting up in Moscow. Timchenko said her life changed forever in 1999 when she joined the online Lenta news team as an editor. She spent 15 years there, 10 as the editor in chief, and she credits Anton Nosik, her late teacher and Lenta’s creator, known as the “father of Russian internet,” for her success. During the 10 years that Timchenko was the editor in chief of Lenta, the news organization had become well known even outside of Russia. In 2010, Harvard University named it the most widely quoted Russian-language blog news source. Toler, who hosted journalism training workshops in Russia that some of Meduza’s staff attended, said the “media purge” really heated up after the crisis in Ukraine. While it was becoming more common, he said, what happened with Timchenko in particular was “catastrophic” and “a big deal” that made international headlines. Toler explained that newsrooms in Russia differ from those in the United States in that they are so much more “individual-focused.” Because one person can shape the entire newsroom in Russia, he said, removing Timchenko was symbolic for her coworkers. When Mamut fired Timchenko and replaced her with Aleksey Goreslavsky, Lenta’s staff of 82 shrank by 77 members. Within an hour of Timchenko’s dismissal, the head of the special reporters department at Lenta, Ivan Kolpakov, posted a letter on the outlet’s website saying Timchenko’s firing meant that the Kremlin was trying to turn Lenta into a government propaganda machine. “We could make the statement and decided that we would right now because tomorrow it’s not going to be possible,” Kolpakov said. Timchenko said she recalls Mamut saying that he had no cards to play with the Kremlin, so he needed to fire her and replace her with someone from Putin’s administration. “Do I have any time?” Timchenko said she asked Mamut. He told her she had one minute until she would be fired. Mamut made Timchenko sign a nondisclosure agreement. She was given one year of compensation, and she was forbidden from participating in the media for three months. “We quickly realized that there was no place for us in this industry, that we wanted to make a new media,” Kolpakov said. Ilya Krasilshchik, former product director and editor in chief of Afisha, a Russian entertainment magazine owned by Rambler & Co., the same firm that owns Lenta, also wrote an online message expressing outrage at Timchenko’s firing. Under Timchenko’s direction, Lenta had become something like the “Russian New York Times,” Krasilshchik said. This status, of course, did not play well with Mamut, Krasilshchik said. Luckily, Kolpakov reached out to him after seeing the post. Kolpakov and Krasilshchik, along with Timchenko, decided to create a media outlet devoid of Kremlin control and, on Oct. 20, 2014, they became the three co-founders of Meduza. Timchenko said it was difficult to believe that they could start an independent media venture – and be successful. The biggest hurdle standing in their way, however, was funding. One of the most well-known Russian ex-oligarchs, Mikhail Khodorkovsky, offered to begin negotiations with Timchenko. Khodorkovsky had been labeled as anti-Kremlin after his political views and successful Siberian oil business ventures prompted Putin to throw him in jail for a decade on fraud charges. Then living in Europe, Khodorkovsky wanted to invest in independent media, Timchenko said. A month before Meduza’s launch, Khodorkovsky re-launched a human rights site called Open Russia, with a focus on independent media, political education, rule of law and support for political prisoners. In 2017, media regulatory agency Roskomnadzor listed his site as “undesirable,” blocking it in Russia. Khodorkovsky suggested that Timchenko’s project be based in Riga, she said, because it is a short flight from Moscow, is a lot more affordable than Moscow and is located in the European Union. And about half of the local population speaks Russian. Khodorkovsky and Timchenko were in secret negotiations from March until early fall, she said, and everything appeared to be going well at first. But when Timchenko was given the final shareholder agreement, she was appalled, she said. After she backed out of the negotiations, Khodorkovsky eventually agreed to an investment. Without disclosing the amount, Timchenko said the investment was meager compared to the original deal. With the Riga launch planned for October 2014, Timchenko needed to find additional sources of money quickly. She said she drove back to Moscow and went door to door asking for money. “It was a very traumatic experience, because who wants to be an investor of media in such a political situation,” Timchenko said. Somehow, though, she managed to get enough money to launch her project. Kolpakov said they keep their donors’ names anonymous to protect them and to avoid putting a political label on the start-up. Although the lack of transparency is not ideal, it is a necessary evil given the dangerous media environment in Russia. According to the Committee to Protect Journalists, unsolved murders and disappearances of journalists in Russia have been on the rise since 2000, with 41 journalists killed to date. These murders attracted international attention after Anna Politkovskaya, a Russian journalist and human rights activist who wrote about the second Chechen war, a controversial topic among Russians, was shot in her apartment elevator in October 2006. Karina Orlova, a Russian journalist now based in Washington, fled the country after receiving threats regarding an on-air interview she did at Ekho Moscvy in 2014. She said everyone who feels unsafe in Russia should leave because nothing can protect them. They launched the project with 14 journalists. Now there are about 30 reporters in Riga, as well as a couple of editors in Moscow and correspondents throughout Russia and in Ukraine and other European countries. How Meduza got its name actually involves a literary mistake. At this point, they had not yet thought of a name, but they knew they wanted something international and something that did not include the word “news,” which would have made it more likely to be blocked on the Russian internet. They wanted to make sure they could create a site that if it were blocked or “cut” off by Russian authorities, it would resume as quickly as possible. In Greek mythology, the creature Hydra is a nine-headed monster. When one of its heads was cut off, two more popped up. But instead of choosing Hydra as the name, one of Timchenko’s journalists thought she was referring to the Greek mythical woman whose eye contact turned men to stone, Medusa. Since its inception, Meduza has become increasingly popular even in Western countries. “We work hard, but frankly it’s like a miracle,” Timchenko said. 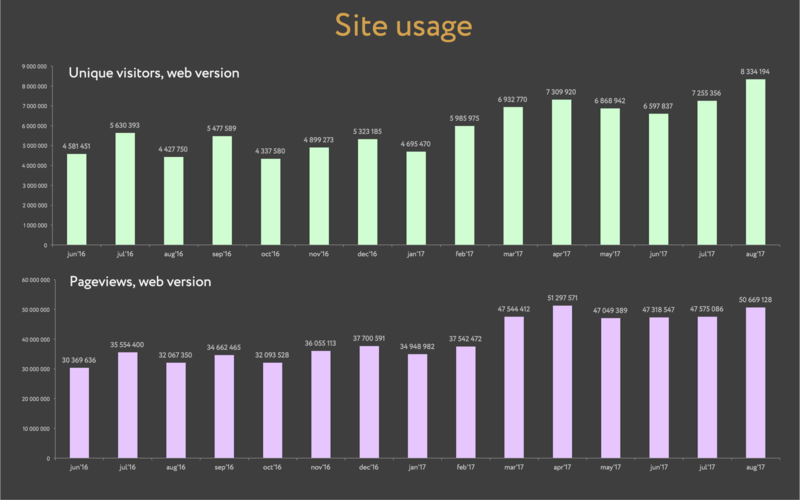 Traffic to the Meduza website has grown to more than eight million unique visitors per month as of August 2017. Meduza is successful because Kolpakov, Krasilshchik and Timchenko bring their different personalities and talents together, she said. “We fulfill all of our plans, but the most important thing is that we are still friends,” she said. Timchenko’s vivacious, spunky attitude syncs well with Kolpakov’s seriousness and Krasilshchik’s wit, she said. When the trio launched Meduza three years ago, Russian journalists from state television stations came to Riga to follow Timchenko everywhere, Krasilshchik said. They would ask local residents if and where they had seen her and what she was doing. In the first few months, some state outlets produced segments devoted to Meduza, portraying the self-exiled journalists as traitors. Russian state television anchors label Meduza as a main competitor and main enemy of Russia, Timchenko said. Roskomnadzor, the media regulation agency, notified Timchenko that she and her journalists would not be in any danger because they were under European Union protection, she said. “We have no intention to do a special punishment for you,” she said the agency told her. At the beginning, she admits, she was afraid. But now she has concluded that there is no point in worrying about something that may never happen. Timchenko said that in Moscow, Meduza correspondents have had some safety problems. She mentioned reporter Ilya Azar’s special report about arsons in Moscow connected to Chechnya. He was caught by Chechen police, Timchenko said, and after spending about nine hours behind bars, he escaped and returned to Moscow. While he was captured, Timchenko published his article, and it received widespread media attention, she said. “But it’s predictable trouble,” Timchenko said. She also noted another incident when the FSB spied on and harassed correspondent Daniel Turovsky, who was investigating sexual abuse in Moscow schools. In November, the Kremlin approved a law requiring certain media outlets, such as Voice of America and Radio Free Europe, to register in Russia as “foreign agents.” Timchenko, however, is unfazed. Natalia Arno, director of the Free Russia Foundation in Washington, a Russian policy think tank, said the Kremlin engages in “cherry picking” to intimidate activists and independent journalists. “They select people to send a message to the masses so the people fear, and so because of that … there is really a lot of self-censorship,” said Arno, who previously worked for a political opposition think tank in Russia. She said she was forced to leave Russia with her son in 2012 after being charged with treason. The Free Russia Foundation supports independent journalists and political activists in Russia and accompanies them when they visit Washington. Arno met Timchenko last May, when she and Kolpakov gave presentations at Washington-based universities and think tanks. “I really respect her,” Arno said. They decide on "Mobile first"
Meduza first launched a smartphone application, then a website. It was the right decision, she said, because almost 70 percent of Meduza’s readers visit through the app. Timchenko said that she wants her core audience to be “youngsters,” because a young audience is appealing to advertisers. Meduza has the youngest audience among Russian news consumers, she said. Seventy percent of its readers are under age 35, and 50 percent are under 25. Timchenko said she appointed Kolpakov, who is 33, as the editor in chief of Meduza, because he is perfectly equipped to engage a younger audience. Meduza’s app features games that incorporate news stories into their goals. The idea for news gaming came from a couple of Russian media outlets that are already using this technique to engage younger audiences with shorter attention spans, Timchenko said. Ekaterina Kronhaus, Meduza’s game designer and Krasilshchik’s wife, creates games that Timchenko thinks will tell stories more effectively than a written narrative. Timchenko, who frequently travels throughout Europe and the United States for media conferences, said Meduza’s games attract a lot of attention. Some of Meduza’s news games mimic popular smartphone games with zombies (replaced with orthodox priests), while others look more like BuzzFeed-style quizzes. BuzzFeed, the New York City-based digital media outlet similarly popular among young people, publicly announced a partnership with Meduza last September. “It’s remarkable how BuzzFeed became the first partner who offered to make joint investigations with us,” Timchenko said. Although it is still early in the partnership, she said she is eager to see the “special skills” from both sides coming together. Under Timchenko’s direction, Meduza drives the conversation on Twitter and Facebook, Elder said. Meduza’s incorporation of serious reporting with sarcasm and humor “feels very at home” for BuzzFeed, she said. In addition to news gaming and partnering with BuzzFeed, Timchenko has added other portals to build up Meduza’s audience reach. Meduza also began publishing podcasts dealing with ethical issues and interviews with journalists. They decided to launch an entire English version, too. Timchenko said she got a tip about an American journalist and policy researcher who had a handle on the Russian language and the complexity of Russian politics. And that led her to hire Kevin Rothrock, now the senior editor of Meduza’s English-language edition. Rothrock previously worked at the American Enterprise Institute, a Washington think tank, and then as an editor at The Moscow Times, an English-language newspaper based in Moscow. He joined Meduza in 2015 as its only English-language staff member. He aggregates materials from other Russian news outlets, translates the most relevant Meduza stories for an English audience and publishes a daily newsletter. “Russia is very in-vogue and interesting to Americans right now,” Rothrock said. He thinks many Americans are not really interested in the typical day-to-day lives of Russians, but they want to hear about alleged Russian collusion in elections and internet trolls. Timchenko said she wants to expand Meduza’s English version but doesn’t have the time or resources right now. She needs to focus all of Meduza’s resources on the Russian version for now, with the Russian presidential elections approaching March 18. Timchenko admits that she has no idea why the Kremlin is so nervous, but she thinks it will be very hard to be stable and to not “get into trouble.” She said, “Putin’s regime has so much in common with old Soviet regimes;” those in power are very old men with rigid ideas. Timchenko explained that the Kremlin conducts surveys about news consumption and politics by telephone, which she doesn’t trust. Who would answer truthfully about political allegiance over the phone? Anyway, she said, the calls are made during the working day when most people aren’t home. The intersection of political activism and trust in the media is also an important topic in many other countries, like the United States, Timchenko said. Kolpakov explained that many of the editors at Meduza’s office in Riga do not like living in Latvia and travel frequently to Moscow to visit family and to train Meduza’s Russia-based correspondents. Timchenko said she doesn’t like to travel to Moscow because she misses the Moscow of her childhood – the Moscow with streets in the center of the city peppered not with skyscrapers but simply with neighborhood restaurants and old, orthodox churches. Timchenko said she and her staff have difficulty interacting with local media. “There is no friendship at all,” she said. In her view, local journalists are either skeptical of why a group of Russians have “escaped” danger by coming into Latvia, or they are upset about “snobby” Muscovites stealing advertising. The latter makes no sense to her, Timchenko said, because she has made it clear that Meduza is not a competitor and is not going after Latvian advertisers. Most of Meduza’s advertisers are in Russia and abroad, such as Mazda, Lego and Sberbank, a large Russian bank. There is no special recipe for grabbing people’s attention, Timchenko said, but she said she needs to fight for her audience’s trust. “The currency of our market is audience attention, so if we could reach our audience in their natural environment … then we could boost readership,” she said. By “natural environment,” Timchenko is referring to social media, emails and podcasts, she said. She credits Donald Trump with reviving Twitter. "Our own environment of freedom"
When she is not offering criticism on her team’s videos and stories or conversing with her editorial staffers in Moscow, Timchenko said she enjoys watching academic lectures on YouTube and reading books. She said household chores can be so monotonous, so she listens to these lectures to help her get through ironing her clothes. Timchenko added that she is a “TV series maniac” and has watched almost every thriller or detective TV series available, especially the British ones. Timchenko used to read literature and fiction but now sticks to nonfiction. She recently read “The Dead Hand: The Untold Story of the Cold War Arms Race and Its Dangerous Legacy,” by David Hoffman. One of the books Timchenko wishes she could get her hands on now is “The Man Without a Face: The Unlikely Rise of Vladimir Putin,” written by Russian-American journalist Masha Gessen. She is unable to find it in Latvia. 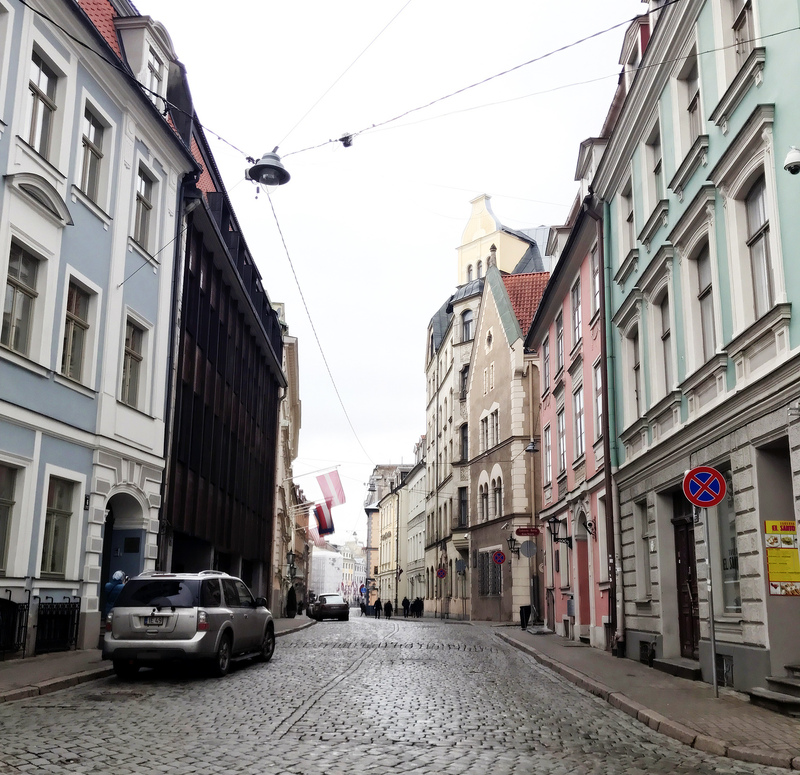 Although she is unenthusiastic about the foggy, gray ambiance of Riga, Timchenko relishes waking up to come into work each day. She shares a workspace with Kolpakov and Krasilshchik on the top floor of their two-floor apartment-turned-office on Krišjāņa Valdemāra Street, next to an Indian restaurant.